Just like other parts of your physical body, teeth naturally wear as we get older. Just the effect from chewing during hundreds of thousands of meals in a lifetime can take its toll. But there are some factors that can make tooth wear worse. By addressing them promptly should they arise, you can keep age-related tooth wear to a minimum. 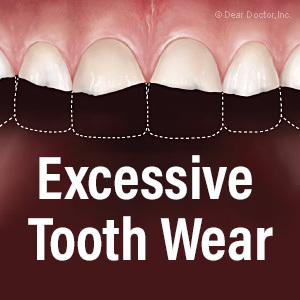 Here are 3 areas to watch for to avoid excessive tooth wear. Dental disease. Tooth decay and periodontal (gum) disease are most responsible for not only the loss of teeth but for compromising tooth health overall. But the good news is they’re largely preventable through proper oral hygiene practices to remove bacterial plaque, the main trigger for these diseases. Prompt treatment when they do occur can also minimize any damage and help your teeth and gums stay strong and healthy. Your bite. Also known as occlusion, the bite refers to how the upper and lower teeth align with each other when you bite down. When they don’t align properly, regular chewing and biting can create abnormally high forces in the teeth and cause them to wear unevenly and more rapidly. Correcting the bite through orthodontic treatment won’t just improve your smile, it can improve bite function and decrease accelerated tooth wear. Bruxism. This is a general term describing habits like teeth clenching and grinding in which the teeth forcefully contact each other beyond normal parameters. There are a number of causes for bruxism, but for adults it’s typically related to stress. Over time, bruxism can accelerate tooth wear and cause other problems like TMD. There are a number of ways to stop or at least reduce the effects of bruxism like relaxation techniques or a night guard worn during sleep that prevents the teeth from making forceful contact. If you suspect you’re experiencing any of these factors, see us for a full examination. We’ll then be able to discuss your condition, the potential impact on tooth wear, and what we can do to protect your teeth.